KIEV, Ukraine -- It has been said that there are no atheists in a foxhole. Here, after my show trial and four and a half months in a cell, I have discovered that there are no atheists in prison, either. 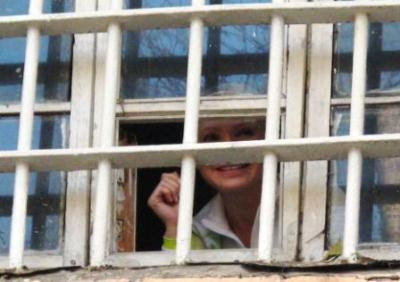 Ukraine's former Prime Minister Yulia Tymoshenko sends her Christmas message from behind bars. When, despite unbearable pain, you are interrogated – including in your cell – for dozens of hours without a break, and an authoritarian regime’s entire system of coercion, including its media, is trying to discredit and destroy you once and for all, prayer becomes the only intimate, trusting, and reassuring conversation that one can have. God, one realizes, is one’s only friend and only available family, because – deprived even of access to a trusted priest – there is no one else in whom to confide one’s worries and hopes. In this season of love and family, the loneliness of a prison cell is almost unbearable. The gray, dead silence of night (guards peer in voyeuristically through a slot in the door), the sudden, disembodied shrieks of prisoners, shrieks of distress and rage, the distant rattles and clangs of prison bolts: all make sleep impossible, or so restless as to be a torment. But what is strange is that your senses are not dulled by this dead and dreadful world. On the contrary, they are ignited by it: your mind is set free from mundane concerns to ponder the inestimable and your place within it – a freedom of spirit that is a truly unexpected gift this Christmas season. In the cell’s darkness, I gather strength and hope from the fact that God somehow seems so near to me here. For where else would Christ be but with those who suffer and are persecuted? Indeed, I have recently been reading Dietrich Bonhoeffer’s sublime and challenging Letters from Prison, in which he yearns for a Christ capable of offering mercy to a world, our world, then in the process of being martyred for a single man. Written in a cramped, dank, and putrid cell, where hope was meant to die before the body, Bonhoeffer crafted a book rich in faith, openness, possibility, and, yes, hope – even in humanity’s darkest hour. One particular passage resonates with me as I contemplate Ukraine’s plight. So I take some comfort this Christmas in knowing that the godlessness, inhumanity, and criminality of the regime that is now ruling in Kiev is, at long last, being exposed to the world in a clear light. Its democratic posturing has been unmasked as cynical political theater, its claim to desire a European future for Ukraine’s people revealed to be a lie, and the rapaciousness of its kleptocrats has been laid bare. The regime’s contempt for the constitution and the rule of law is now undeniable, and that clarity is empowering. More importantly, the suffering of Ukraine’s people has also become more widely known, and we are no longer so alone in our plight. Alleviating it has been embraced as a just cause across Europe and around the world. The everyday oppression, stifled media, and shakedowns and extortion of businesses for bribes all point to a mafia state on Europe’s border. Now our European friends can no longer deny the smug vileness of the regime with which they are forced to deal. And I am thankful this Christmas for being able to believe that democratic Europe will not tolerate this state of affairs. Ukrainians will be strong knowing that they are not alone in their fight. I do not pretend to be an expert on religious faith and spiritual values. I am only a believer who cannot accept that our existence is the result of some freak cosmic accident. We are, I believe, part of a mysterious yet integral act, whose source, direction, and purpose, though difficult to grasp at times, does have meaning and purpose – even when one is confined behind prison bars. It is only faith in the idea that our lives matter, and that our decisions must be judged by their moral content, that we in Ukraine, and elsewhere, will be able to find our way out of the misery, unhappiness, and despair that has consumed us over the last two years. It is within our power to recover or reinvigorate our freedoms and our societies, not by individual efforts, but by joining forces with like-minded people all over the world. I know that we will manage this. This Christmas, I ask my family and friends everywhere not to worry about me. Indeed, I am more alive, I know, than the men who have imprisoned me here. Christmas is meant to mark the possibility of a new beginning for all men and women. Sites like this are really helpful one for readers like me. We get to know many things from the site.News local as well as across the world. Keep up the good work and continue to be the same and better in the future.